Alaska is currently experiencing a shortage of fisheries technicians and fisheries biologists – a trend predicted to continue for at least the next 10 years. 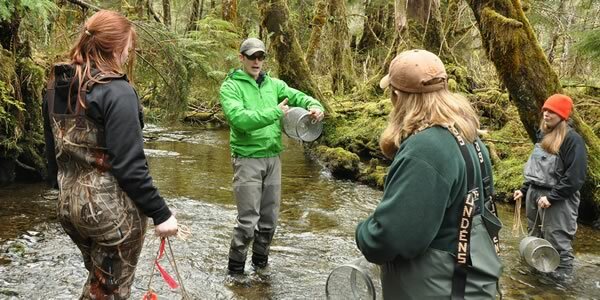 The University of Alaska Southeast, Sitka Campus, has partnered with industry and regulatory agencies to develop programs that can meet this growing need for qualified personnel. Companies within the fisheries industry have donated scholarship money to make internship opportunities, training and work experience a large part of the education process. The resulting programs are the Fisheries Technology Occupational Endorsements, Certificates and the Associate of Applied Science (A.A.S.) in Fisheries Technology. UAS Fisheries Technology faculty and staff are available to discuss job availability, career paths, or educational next steps. Completion of our programs can lead to employment opportunities in a wide range of technical and non-technical careers. Most Fisheries Technology courses can be taken online, at your own pace. Sitka students can also enjoy the benefits of face-to-face classroom experience, since almost all of our courses are delivered in a "hybrid" format with local students attending lectures while eLearning students tune in over the internet. This format also allows you to review missed classes via the archived audio and screen record of live classes. In addition - beginning this fall with instructor approval, students can take select courses via iPad. These "off the grid" courses allow you to complete an entire course independent of the internet whenever you can squeeze it into your busy schedule. The waterproof iPads - provided as a free loan by UAS - contain all lectures, videos, readings, FAQs, and even the exams which you can take remotely without proctoring services. iPad course offerings include: FT120 - Introduction to Fisheries of Alaska, FT122 - Alaska Salmon Culture I and FT222 - Alaska Salmon Culture II. For online access you will need a computer with a good internet connection, either at your home or at your nearest UA partner campus. Certain courses include concentrated lab sessions, designed to give you hands-on training and provide the opportunity to work with classmates and instructors in a collaborative environment. These courses require physical attendance for up to one week at UAS Sitka Campus or at one of our partner campuses in Ketchikan, Valdez, Homer, Kodiak and Bethel. Members of the fishing industry and Alaska state regulatory agencies frequently offer local working internships for UAS Fisheries Technology students, providing a valuable opportunity to explore a variety of career options. For more details about the iPad delivery method, contact Reid Brewer at 907-747-7799. Our Student Success advisors are on hand to help you find and apply for available scholarships and grants. Please refer to our Financial Support section for an overview of your options. To provide scholarships for students attending the University of Alaska Southeast Sitka Campus. To provide an award to assist students who have demonstrated the potential for academic success and who, for financial reasons, might not otherwise have access to post-secondary education. The award is intended for Southeast Alaska students attending the University of Alaska Southeast Sitka Campus, both in Sitka and by distance delivery through the Sitka Campus. To provide scholarships for junior or senior high school students enrolled in the Sitka Borough School District to attend one and not more than two courses per semester at the University of Alaska Southeast, Sitka Campus during high school. Secondary priority is to provide members of the Sitka community with scholarships to attend University of Alaska Southeast Sitka Campus. Recipient must be a Petersburg High School dual enrolled student at the University of Alaska Southeast. Minimum GPA of 2.0. Must meet UAS eligibility standards for financial aid. Recipient must be enrolled in a Career and Tech education program at the University of Alaska Southeast. Minimum GPA of 2.0. Must meet UAS eligibility standards for financial aid. This scholarship is intended for AHIMA members pursuing a CAHIM accredited Associates Degree in HIM or HIT. View the American Health Information Management Association (AHIMA) website for details. Recipient must be enrolled in Fisheries Technology at the University of Alaska Southeast. Minimum GPA of 2.0. Must meet UAS eligibility standards for financial aid. Applicants who intend to concentrate in fisheries science, natural resource conservation, and related fields will receive particularly close consideration. Applicants for the hatchery technology scholarships, if not graduates of the high school programs listed below, must have Alaska hatchery work experience or be enrolled or admitted to an accredited hatchery technology program in Southeast Alaska. Open to all graduates of high schools in Juneau, Haines, Skagway, Hoonah, and Chatham School Districts, and graduating home school students residing in Juneau, Lynn Canal, or northern Chatham Straits area. The University of Alaska provides over $2 million in scholarships annually. A list of available opportunities and the application process are detailed at the above website. Three $2500 scholarships are available annually. Those eligible to apply are those who hold a current State of Alaska salmon limited entry permit and paid enhancement tax to NSRAA in the year prior to the application, and their children. NSRAA full-time and seasonal benefited employees and their dependent children and other immediate family members are also eligible to apply. Application forms may be picked up at (or requested from) the NSRAA office in Sitka. Forms will also be available at the counselor’s office at your local high school. The application period runs from January 1 through April 15 (or the Monday after the 15th if the 15th falls on a weekend). The scholarship is not limited to students who intend to study fisheries. View list of fisheries technology internship opportunities. View list of fisheries technology job openings. The UAS Fisheries Technology Pathway to Employment Project is 100% funded through a $2,507,463 U.S. Department of Labor, Employment and Training Administration, Trade Adjustment Assistance Community College and Career Training Grant. UAS is an AA/EO employer/program and auxiliary aids & services are available upon request to individuals with disabilities.